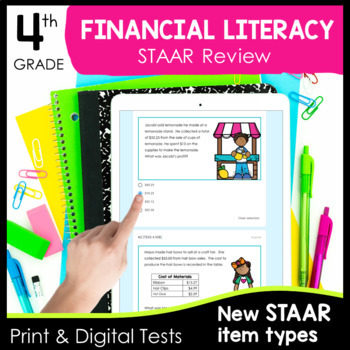 This resource includes 2 ten question assessments that cover the Financial Literacy TEKS. The questions are STAAR formatted. Questions cover knowledge of how to calculate profit, fixed and variable expenses, basic purpose of financial institutions, advantages and disadvantages of savings options and allocating between spending, saving and sharing. 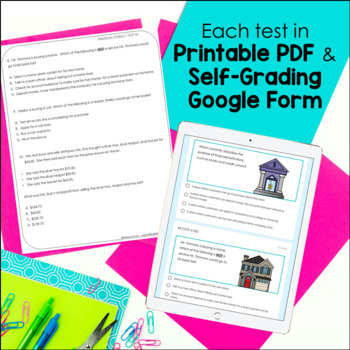 These tests are great to use for Formative Assessments, since the key makes it easy to record data while correcting student tests so that you can respond to student needs. These are perfect to use at the end of your Financial Literacy Unit to assess student learning. The key shows the TEKS alignment and topic covered by each question and provides space to record the names of students who missed each question. The key makes targeted reteach easy to plan! These assessments are formative because they are designed to help you as a teacher collect data on student understanding and use that data to help you make informed instructional decisions. ✅Use the 1st test after your Financial Literacy Unit. Based on the results, do targeted reteach and review. Use the 2nd test to re-assess students. ✅Use the 1st test after your Financial Literacy Unit. 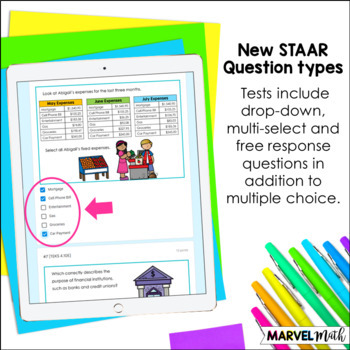 Use the 2nd test as part of your STAAR Review. ✅Use the 1st test as a pre-test, use the 2nd test as a post-test.